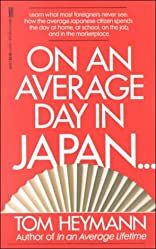 A demographic peek at the people of Japan outlines the typical daily activities of an average citizen. By the author of On an Average Day. . . and In an Average Lifetime. About Tom Heymann (Author) : Tom Heymann is a published author. A published credit of Tom Heymann is On an Average Day in Japan (On An Average Day).